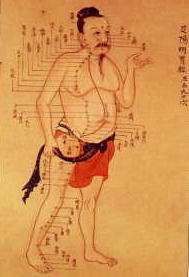 Acupuncture has been used as a healing modality for over 3,000 years. It stimulates the meridians and points in the body which are pathways for Chi or energy to flow. "Traditional Chinese medicine (TCM) treats autoimmune disorders by reducing inflammation, alleviating pain, improving energy and vitality, and addressing the wide variety of symptoms that occur. TCM also treats the root of the disease by bringing the immune system back into balance." Cindi Ignatovsky, L.Ac. "Typical Western treatments involve the use of medications with varying degrees of effectiveness and toxicity. These drugs do not cure the underlying cause of the disorder. Instead they address the symptoms or suppress the immune system in order to keep symptoms under control. The side effects of these drugs can be toxic, especially to the liver and kidneys." more at Cindi's site.